In emerging countries, the global trend of higher healthcare expenditure has not led to increased penetration of private health insurance, which remains insignificant with a 2% share of total healthcare expenditure. With the right regulatory framework, private health insurance can have an important and beneficial effect on the sustainability of health schemes to which individuals, governments and employers contribute. 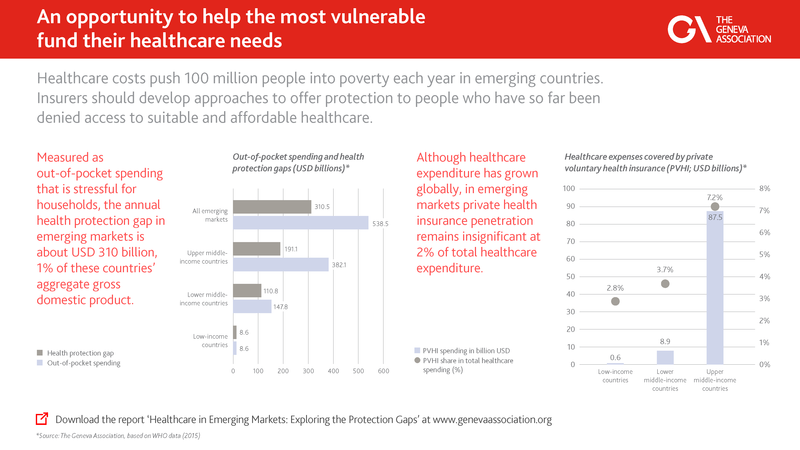 The report ‘Healthcare in Emerging Markets: Exploring the Protection Gaps’ analyses the health protection gap as out-of-pocket spending that is financially stressful for households. The Geneva Association estimates the annual health protection gap in emerging markets at about USD 310 billion or approximately 1% of these countries’ aggregate gross domestic product.